Figure 1. 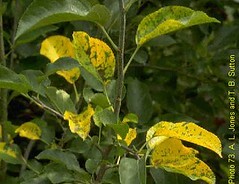 'Golden Delicious' apple leaves showing leaf blotch and yellowing associated with NLB. Photo: T. B. Sutton, North Carolina State University, and A. L. Jones, Michigan State University. 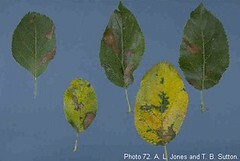 Necrotic leaf blotch (NLB) is a physiological disorder whose occurrence is related to air temperature, light intensity, and soil moisture. The cause of NLB of apple is not known. Symptoms that are enhanced by gibberellins and reduced by abscisic acid are evidence that a hormonal imbalance may be involved. The disorder occurs worldwide on ‘Golden Delicious’ and its bud sports. ‘Golden Delicious’ seedlings vary in susceptibility. ‘Prime Gold’ and ‘Nugget’ are affected by NLB also. The disorder is characterized by the development of necrotic blotches, or irregular areas of dead tissue, in mature leaves (fig. 1). Mid-shoot leaves are most often affected (fig. 2). Blotches are limited by the leaf veins and vary greatly in size. Affected leaves begin to turn yellow after about 4 days and abscise a few days later. Some green leaves with NLB also are lost by abscission. Two distinctive characteristics of NLB are that the symptoms develop suddenly, almost overnight, and in waves, generally from June through August. Figure 2. 'Golden Delicious' apple shoot showing the mid-shoot location of leaves with NLB. Photo: T. B. Sutton, North Carolina State University, and A. L. Jones, Michigan State University. The disorder tends to be more common and severe later in the summer and usually appears when a cool, rainy period is followed by hot summer weather. Some orchards or trees within an orchard show little or no defoliation, while other orchards or trees reach 50% or greater defoliation. Although it appears that NLB is not caused by a fungus, a bacterium, or certain air pollutants, growers' use of the dithiocarbamate fungicide ziram or thiram in the summer spray program reduces the disorder. Foliar applications of zinc oxide also have been effective in reducing the severity of the disorder.